My Third Win at the Site Where it All Began. Threadless has a special place in my heart. This is because a. I got my love of T-shirt design from there and b. I met my wife through that site! After an eight year hiatus I got my 3rd print, have to say it felt pretty great. I first got printed back in 2008 with my first ever submission to the site “I’m with…”. My second win, ‘Thou Shall Not Steal’ was a little later that year. So after many submissions and a lot of high scores I finally got a 3rd win with a design submitted to the Sublimation contest! 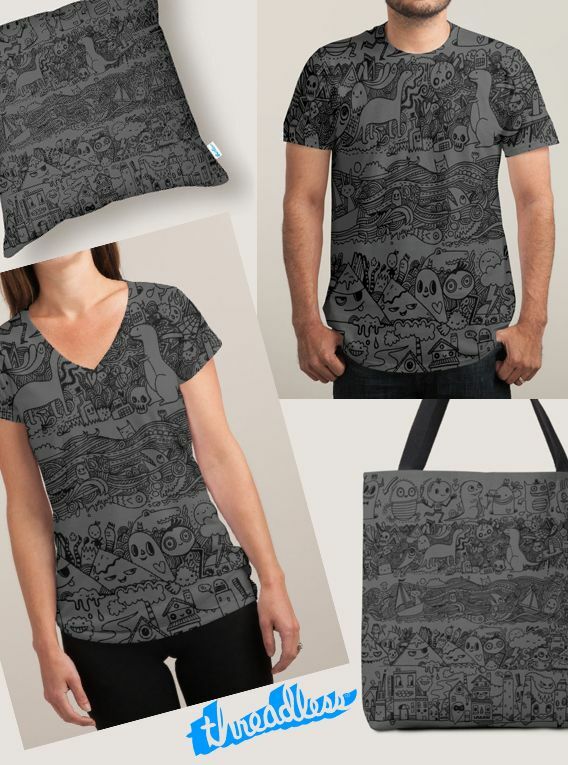 The new winning design is called ‘Many Layered Doodle‘ and it features a mass of layers filled with themed doodles; houses, dinosaurs, the ocean and monsters. This is the style I am most well known for and as an all over sublimated print it works very well. Threadless has changed a lot over the eight years, with a core of their catalog going to print on demand. The one disappointment in winning this time was that Threadless no longer do exclusive staff photography for the winners, so the images were all mocked up in Photoshop, which isn’t nearly as much fun. I did however get samples and the tees, cushion and tote bag were all printed very nicely. The design is available in tees, tanks, pillows, tote bags, wall art and phone cases! Threadless and I go way back and the brand has been a big part of my success. They will always bring good memories for me and I’m super happy to be back there.